Spring is almost here, and that means we're shifting gears from accepting our winter weight (and eating every carb in sight) to making healthier decisions (salads!). So, in the spirit of looking ahead to warmer days, we've got healthy eating on the mind. We can no longer use things like the holidays or chunky sweaters as excuses to nom at will. But, making a drastic switch from comfort foods to lighter options can be tricky. So, we hit up Chef Gregg Drusinsky from Neuehouse for some power-lunch recipes. You know, nutritious foods that are delicious, and will keep you full and energized for the day. No tummy grumbles here, folks. Photo: Courtesy of Bryan Zabka. 1. In a blender, add the fish sauce, Sriracha, Dijon mustard, rice-wine vinegar and garlic and blend until well mixed. 2. Keep the blender on a medium speed and drizzle in the oil until the dressing becomes smooth and emulsified. 3. Using a mandolin on a medium setting, shave the baby carrots into thin slices about 1/8-inch thick or less. 4. 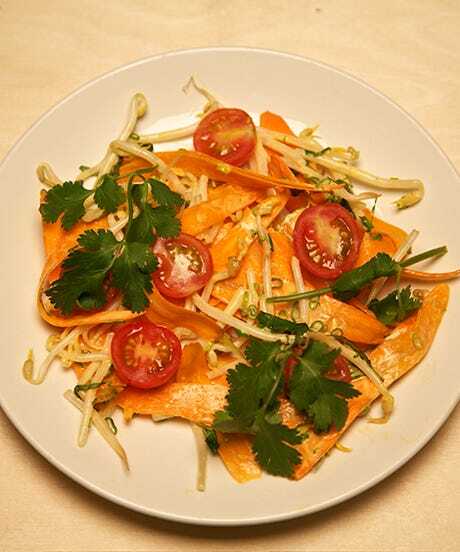 In a mixing bowl, toss the carrots, bean sprouts, tomatoes, scallions, mint and basil in the dressing until well coated. 5. Season with salt and pepper. Transfer the salad to a plate and sprinkle with the peanuts and picked cilantro. Photo: Courtesy of Brian Zabka. 1. Preheat the oven to 300 degrees F.
2. To make the vinaigrette, add the apple cider vinegar, mustard, and one cup maple syrup to a blender and mix until creamy. 3. Drizzle in the olive oil and blend until emulsified. Season with salt and pepper. 4. Cut the pears into sixths and remove all of the seeds. Toss with remaining maple syrup and freshly ground black pepper. 5. Place on a parchment-lined baking sheet and roast in the oven for 30 minutes. 7. Shave the fennel bulbs on a mandolin fitted with a medium setting and set aside. 8. Slice the endive into 1/4-inch thick slices and separate with your fingers. 9. 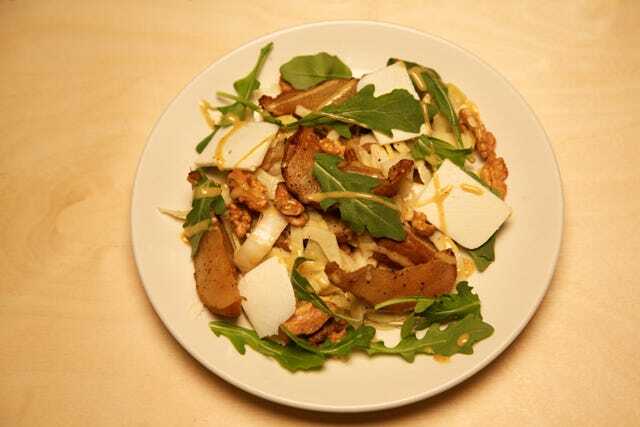 Mix the endive, pears, and fennel in a bowl and dress with the vinaigrette. Transfer to a plate and top with candied walnuts and baby arugula, and shave ricotta salata over the top.